In a flat fare system, it is impossible to allocate fare revenue in any way that makes sense and produces meaningful comparisons between routes. Every trip (and hence fare paid) represents one or more “unlinked trip” in planning lingo. Every time you change vehicles, that’s a new unlinked trip or “boarding”. It turns out that the average trip consists of roughly two boardings. In other words, the average passenger transfers once. Some don’t transfer at all, some transfer twice or more. The average fare is divided by the average number of boardings per trip to produce the average revenue per boarding. The subway counts as one route regardless of how many times you transfer. I am not sure about the SRT because none of the rapid transit lines appears in the annual statements (more about that later). The TTC cooks the figures to correct for the fact that some routes have a higher proportion of riders whose entire trip is on that route. They should contribute a full fare to the route’s revenue. Of course, this leaves less revenue to spread around among those who transfer. There is no documentation of the underlying assumptions, but the stats clearly show that wildly different values are assigned to the revenue per boarding on different lines. Cost allocations are actually done on a more reliable basis thanks to work by me and others many years ago to identify underlying problems with “average” operating costs. Costs which tend to be sensitive to the number of vehicle hours (notably operator wages and, possibly, some aspects of vehicle operation) are assigned to vehicle hours. Costs which tend to be sensitive to the distance the vehicles travel (notably routine maintenance and fuel) are assigned to vehicle miles. Costs which tend to be sensitive to fleet size (notably garaging and routine cleaning) are assigned to peak vehicles. There can be some debate about the fine points of these allocations, but they are generally defensible. However, they are not directly useful for comparisons between routes with vastly different operating characteristics. For example, we all know that fuel consumption goes through the roof in stop-and-start traffic, and you cannot take the average fuel consumption of the bus system and use it directly to project the cost on a congested route like Queen. Let’s look at the most recent statistics published by the TTC for the 2005-2006 period. Something should jump out at you on the very first line: the 192 Airport Rocket has a cost recovery of only 22% and yet it never shows up on the list of “Poor Performing Routes”. Even more amazing, we know that this line is overcrowded and that TTC has been forced to add service. Why are the statistics so bad? Simple: It is a line haul route that picks up passengers at Kipling and delivers them to the airport. There’s a good chance that when it’s busy outbound, it’s quiet inbound. The number of boardings per unit of service operated is considerably below that of the bus routes collectively. Regular routes have a lot of turnover with passengers boarding and alighting all along a route. This yields many more boardings (and hence allocated revenue) per hour or kilometre of service, and a better cost recovery number. Another interesting point about the 192 is that it has the highest cost/hour of service, but the lowest cost/km. This is easy to understand. The average speed of the vehicles is double that of the rest of the bus system and so for each hour of operation, the costs related to mileage components are much higher than on the rest of the network. Conversely, when we look at the cost/km, the high average speed dilutes the cost of the operator and we get a much lower value than on the system as a whole. By now you are probably wondering whether I have already sliced and diced the TTC’s figures to make life easier for analysis. Here is the same data presented with several additional fields. Boardings per hour. These give a measure of vehicle utilization in terms of turnover, the number of people who get on (and off) per unit of service. Coxwell 22 is the high roller among on an hourly basis because it is a very short route (Danforth to Queen), it has strong bidirectional loading and it has a good turnover at its midpoint, Gerrard. However, both the Spadina and Dundas cars beat it out on the system overall. These routes handle a lot of short trips. Boardings per kilometre. These values behave similarly to the hourly values, but due to differences in the average speed of each route, the relative positions in the list will change. Among the buses, Main ranks highest followed by Wellesley. The values for all of the streetcar routes are higher than the average for the entire bus system. This reflects both the density of demand and the larger size of the vehicles. Revenue per boarding. This shows how different values are used depending on the imputed proportion of one-seat rides on each route. Note that the streetcar routes have a higher revenue per boarding (81 cents) than the bus routes (71 cents) reflecting the higher proportion of one-seat trips taken on streetcar routes that serve both the origin and destination for many neighbourhoods. Cost per boarding. This value varies a lot between routes. For the streetcar system, the cost per boarding is higher than on the buses due to the much lower average speed on the streetcar routes. However, the ratio between these costs is much lower than the ratio of speeds because of the larger vehicle capacity on streetcar routes. Revenues and costs are also shown per hour and per km along with the average speed. Note that this is the actual number of kilometres divided by the actual number of hours in the TTC tables and gives the all-day average including garage mileage. These numbers will be different from those shown in the TTC schedule summaries. The values are totalled for each mode and for the system overall. The real standout in these figures is the system total cost recovery of only 49% for the surface routes. This shows that a huge amount of revenue is allocated to the subway system in the model. More importantly, when people discuss cost recovery, the surface routes are already at a disadvantage because so much revenue goes to the subway system. The “sorted stats” file contains two versions of the same data, but they are presented differently than before. The first three pages show the routes ordered by percentage cost recovery, and the routes earmarked for cancellation are highlighted in red. Note how many routes have recovery rates lower than those to be cancelled. The usual explanation for their survival is that cancelling them would inconvenience too many riders, or would cost to much in lost riding, or a variety of other excuses. The fundamental point is this: when we talk a bout “poor performing routes”, we should be talking about routes that don’t do very well, but too many people will complain if we cut them. Another notable point is that some of the routes proposed for elimination have cost recoveries very close to the system average of 49% for surface routes: Bloor West, Pharmacy, Mortimer and Lambton are at 46% or better. Meanwhile, routes like York University, Scarborough, Highway 27 Rocket, and Steeles East are below 40%. The figures published by the TTC cannot be used to identify candidate routes for service cuts. However, the TTC persists in painting these routes as the bottom of the barrel, the ones that just have to go, when in fact many surviving routes, routes where service improvements are planned, do as badly as routes that are on the chopping block. Pages 4-6 of the sorted statistics show the same data again, but with one column added: the imputed daily loss for each route. For many reasons discussed earlier, this figure is very suspect because it depends on the revenue allocation technique. In some cases, overlapping routes are joined as one for reporting purposes, while in others they are separate. This exposes some routes to scrutiny and hides others. As I said before, routes that provide only tripper service such as 503 Kingston Road and 508 Lake Shore will always have poor cost recovery as we would expect from peak-0nly trips on any route where loading is unidirectional and the proportion of truly productive mileage operated is low. The intent of this table is to compare with the stated loss on the Sheppard Subway of $10-million/year. This is actually the net cost of running the subway rather than the bus routes it replaced, and this number is subject to verification. In any event, a back-of-the-envelope rule for converting between weekday and annual costs is to scale up or down, as appropriate, by a factor of 300. This presumes that all of the weekends and statutory holidays are equivalent to about 50 weekdays, and that there are 250 regular weekdays in a year. One could quibble, but the numbers will be correct for the purposes of rough comparison. This gives us a daily cost of the Sheppard Subway of about $33,300, and you can compare this to the rest of the system. The Finch East and Steeles East buses are in the same league as is the Carlton streetcar. Again, this is subject to the faith that you place in the TTC’s revenue and cost allocation schemes. Far be it for me to turn into a Sheppard Subway booster, but it’s important that everyone understand that running major routes costs a lot of money even with buses, let alone a subway network. The TTC is feeding the public and Council a load of baloney when it talks about “Poor Performing Routes” because these have been plucked from a much longer potential list and carefully examined to minimize the fallout from any cuts. Many routes lose far more per rider than those in the dreaded lists, but they are immune. Before we start running around the transit network axing suspicious routes left and right, it’s important that we remember that this is a network and when you start taking parts away, you damage more than the individual pieces. That’s what happened in 1996, and it will happen again if we don’t fight for the system as a whole. Tomorrow (or maybe the day after), I will review the proposed cuts to see which Councillors’ wards are most affected. “Before” and “After” route maps for each ward would look nice, but I will leave that to the folks who have a graphics department to pull that together. A comment on this item from Jonathan prompted me to review recent TTC reports. He asked whether decisions on routes were being made with out-of-date data. As you can see, the passenger count has been flat for a few years, and it took a real beating from the combination of the early-90s recession and the mid-90s service cuts. For 06/07, there has been a big jump back to a level we have not seen since 1991/2. 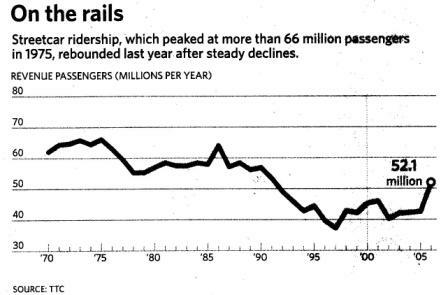 The jump in 1997 is caused by the conversion of the Spadina line from bus to streetcar. Some RGS-related improvements came into the streetcar system, but the jump in riding is disproportionate to that. Therefore, the performance of the streetcar system as a whole is underreported in the tables I have published. There is no comparable published data for the bus system, but I would not be surprised to see strong growth there too. I am impressed with the data sorting, although I have yet to take a close look at it. Although you have identified use patterns among routes, which I agree is more important than blanket averages, one stat that I would find particularly valuable, but is a logistical nightmare to assemble, is how many boardings are made with transfers or passes (as those are technically non-revenue boardings, the revenue boarding would go to the first boarding on which the transfer was obtained, or to the pass which goes to the system as a whole directly, not a specific route). This would affect the impact of the route on the network, as so could be rather valuable, but I don’t know if there is any way the TTC could actually gather such data in an accurate or realistic fashion. Steve, when you say the Sheppard deficit compares to the buses it replaced – does that take into account how many buses it would take to replace the subway at current load standards or is it strictly compared to the service prior to subway start. Steve: The $10-million figure is the TTC’s claimed saving from closing the line, and obviously they would have to run service much like they did before the line opened to make up for it. There is supposed to be a detailed report in September to validate that this saving would actually materialize. Another example of “how the heck do they justify it?”: It is amazing that the 160 LAWRENCE-DONWAY has survived any attempt at budget cuts, even the drastic 1996 reductions. Why? Steve: Actually the Lawrence/Donway route is on the list to be dropped, but in the stats it is lumped in with the Sunnybrook route (with which it is interlined) and so isn’t highlighted in my tables. I have a question about something you’ve mentioned on here before. Are the “boardings” numbers recent and updated data or are they a few years old? Also are they all from the same time period or different? I recall you talking before about how the TTC’s ridership counts for individual routes aren’t frequently revised. Is this data impacted by that? It would also be a shame to start axing routes based on the number of passengers from five years ago. Steve: Yes, there are variations in the age of the counts, and this is easy to see when you look at them over several years where the same count appears two or three years in a row for some of the major routes. Later today when I have time and access to the source material I need, I am going to compare the most recent published counts with the annual streetcar ridership chart that was in the Star a week ago. The streetcar routes showed a big jump in riding (and with little or no extra service), but this will not be reflected in the stats published here. More info to follow. Is it possible to figure out total income per ward? I guess a few asumptions would have to be made (if a route is in multiple Wards divide it’s income by % of route in each Ward)…it would also be interesting to see ridership change per ward over the years…it would definitely be useful for encouraging votes in favour of transit in general. Steve: This gets really messy. For example, someone who gets on a bus in Scarborough and goes downtown via the RT and subway conributes “revenue” through the TTC formula to the bus, the RT and the subway. We have no record of linked trips and therefore don’t know which route, let alone ward, their fare should be allocated to. On the return journey, they board downtown, and we would need to know their destination. The big problem is that the revenue allocation model is deeply flawed, and the TTC should be concentrating on how well a route is used. Even the cost side can be misleading because on short routes, it is impossible for someone to make a long journey and therefore the cost of their trip will be low even at moderate vehicle utilization. It seems as though the “poor” performing routes that would be canceled are routes that have good alternative service nearby; for example, Victoria Park for Pharmacy and Cosburn for Mortimer; even Mississauga Transit for Bloor West. Eliminating Mortimer would surely make Cosburn, which isn’t a particularly stellar line, better. Some routes have to operate regardless of their performance because there is no alternate service in the area, like Scarlett Road. You wouldn’t even save $10 million by closing the Sheppard Subway, would you, because you would have to have the old 2 minute service on 85 to Sheppard Station as a replacement. I suspect the Sheppard Subway closing is meant as a political statement to get the funding the TTC needs – no politician would allow a rail line to be closed. In any case, 40000 passengers is small by subway standards but the line is only 5 km long – which gives a daily average of 8000 passengers per km, which is lower than the other subway lines but much higher than any surface line. Steve: My issue is with the perception the title “poor performers” gives that the target routes are really the bottom of the barrel. If we are putting all routes up for evaluation just to see which have services nearby (love those long wintry walks), then “poor performance” has nothing to do with it. This becomes especially critical when you look at the much longer list of route segments that would be curtailed or eliminated. The Bathurst Streetcar supposedly only has about 13,600 Boardings a day? Then why do they even keep that as a streetcar line? wouldnt a normal bus operation (using hybrids) be a better idea then wasting money on track repairs AND using valuable streetcars that could be used on routes like Spadina, on bathurst? Sorry for going a little off-topic however. Steve: Two issues here. First, Bathurst has much higher loading on days when there are events at the CNE, and the capacity of a streetcar line is needed for those events. Second, if you look at the number of boardings per vehicle hour or kilometre, you will see that they are higher than major routes like Queen. Bathurst is a short route, but it carries a lot of passengers with relatively few vehicles. Alas, it has also suffered, like Queen, from widened headways thanks to the use of ALRVs. This has not encouraged ridership. At 40,000 riders per day for Shepherd, This is only exceeded by 4 streetcar routes (Carlton, King, Queen and Spadina) and one bus route (Dufferin). Prior to the Shepherd subway, Shepherd-Don Mills was a street corner transfer. It now has, I would guess, about 4,000 transfers per hour during the rush period. Previously these were distributed among a number of locations. Would these locations and services (i.e. Yonge-Shepherd) currently have additional capacity to handle the additional buses and transfers? Steve: An excellent question. Some routes would run straight through to Yonge as they did before the subway opened, but there would be more transfer traffic at Don Mills and Sheppard. Also, I suspect that some folks who now come south to Sheppard would divert west via the Finch East and Steeles East services, neither of which has any room for them. I am going by what Chris has said on this subject: that poor performing routes have good alternative service nearby. I have read several documents related to proposed TTC changes. In it, it talks about “New Riders”, that is if a route was to be created would it attract new riders to the TTC or pull riders from existing routes. Cancellation of TTC routes would also take into account these “New Riders” in the sense that cancelling these routes would lose these riders to the TTC. For example, the 39 Finch East bus route may have a lot of “financial loss” but it also has a lot of riders attached to it. The reason why the loss is so great is that the TTC needs a large number of buses to transport these riders great distances. The TTC seems to be not concerned about the “financial loss” as it is concerned about losing the number of riders, or maybe the financial loss on a “per bus” basis (your figures take the potential loss per bus and multiply by the number of buses used to serve the route). These riders want to go somewhere, so cutting a route like 39 Finch East would do big damage to the network. Eleven routes on the list for the chopping block catch my attention: 115 Silver Hills, 167 Pharmacy North, 8 Broadview, 160 Bathurst North, 74 Mount Pleasant, 49 Bloor West, 62 Mortimer, 67 Pharmacy, 127 Davenport, 132 Milner, and 10 Van Horne. All of these routes have some level of parallel operating service or intersect other routes that would operate to the subway. 115 Silver Hills: Much of the boardings occur on York Mills Road, in which the 95 York Mills and the 122 Graydon Hall routes would serve as alternates. The reason why this route is “poor performing” is that very few riders get on or off at the point of the route between Leslie and York Mills and Bannatyne and Woodsworth. This is why they had considered merging the 115 Silver Hills and 78 St Andrew routes together. Also to be considered is the neighbourhood: a good number of older homes are being torn down and being replaced by larger mansion-style homes. And you can be guaranteed that none of these people will ever take TTC. 167 Pharmacy North: The TTC considers this route to be poor performing as it can easily be covered by both the 24 Victoria Park and 85 Sheppard East routes, the former with a higher service frequency than the Pharmacy routes. For a time, the 24 Victoria Park route served the portion of Pharmacy between McNicoll and Steeles during its service period. There are also some apartment buildings located at Finch and Pharmacy, the TTC considers those to be covered by the 139 Finch East express also operating to Don Mills Station. 8 Broadview: The portion between Broadview Station and O’Connor and Pape can be covered by the 100 Flemingdon Park Route. East of Pape, the TTC considers the 87 Cosburn to be an alternate, as most riders come from areas south of Broadview, and thus the 87 Cosburn would be able to take the riders from Broadview. 160 Bathurst North: The only reason why the TTC keeps this route is because York Region wants to maintain it (which doesnt make sense, the YRT now has routes running on Bathurst to Finch Station), and they are paying the TTC to run this route, the same reason why the 107 Keele North is also kept but has the poorest cost recovery. Otherwise if York Region were to pull its funding for this route, the TTC would cancel this route in a heartbeat. All riders would be covered by the 7 Bathurst Route and could transfer at Sheppard and Wilson. 74 Mount Pleasant: This would was supposed to be merged with the 103 Mount Pleasant North route, with service running along Merton Road. South of Merton is a cemetary in which there is potentially no ridership. The TTC had a decent idea about this route, as the south end of the route could be served by the 88 South Leaside route. 49 Bloor West: Bloor Street intersects with the East Mall and the West mall, both of which have large number of apartment buildings and both are served by the 111 East Mall and 112 West mall services, which go to Kipling station as well, which is why the TTC wants to cut it. The only area not covered by these routes is the Markland Wood area. I don’t know the neighbourhood that well and I don’t know the type of housing in that area as well. I’m guessing that this is a suburban area without apartment buildings, after all, the TTC would be foolish to cut the route if it feeds into high density areas. 62 Mortimer: The TTC considers the 87 Cosburn route to be the alternate. Also, it should be pointed out that riders near major transfer points could take routes direct to the subway instead of this route. The route itself is likely a benefit only for those who are taking trips entirely on Mortimer Drive. As there are several apartment buildings along this route away from transfer points, cutting this route may be considered questionable. 67 Pharmacy: For your information, the TTC is not interested in cutting the entire route, only the portion of the route north of Rannock would be eliminated. The portion south of Rannock has several apartment buildings along the street and cutting it would be detrimental to the network. North on Rannock however is just single family housing, which could be served by the 24 Victoria Park route. There is a large cluster of apartment buildings at Lawrence and Pharmacy, but the TTC would consider those covered by the 54 Lawrence East route. 127 Davenport: The portion west of Symington is covered by the 168 Symington route. Other than that, this route has two things going against it: 1) there are many services it intersects that head straight to the subway and 2) a railway line lies to the immediate north of the roadway, meaning that riders would be coming from the south side of Davenport. These riders could be covered by the 26 Dupont route, but it should be reminded that if the TTC cuts this route, they had better think twice about cutting Dupont. This area needs a east west route and cutting both would be detrimental for the TTC. 132 Milner: The portion of the route running along Milner would be covered by the 85 Sheppard East route. It also runs in close proximity to the 133 Neilson route, although the area of townhouses along Brenyon way should merit some service. This route makes intersections with three routes that run to Scarborough Town Centre: 1) Milner and Progress (134 Progress, there are also office buidings and townhouse complexes in that area), 2) Milner and Neilson (133 Neilson) and Brenyon and Sewells (131 Nugget, there are also apartment buildings in the area which can also be covered by 133 Neilson). 10 Van Horne: Prior to the introduction of the Sheppard Subway, the purpose of this route was to provide service from the Don Mills Circle apartments to the Yonge Subway. Now that the Sheppard Subway has been built, the 25 Don Mills Route now handles that role, which is why this route is on the chopping block. I would suggest the TTC consider expanding the west portion of the route to Leslie Station so that it covers a greater area and increases service on the portion of Leslie between Van Horne and Leslie Station. For the record, I’m not in favour of service cuts as you are, Steve, but I’m playing devils advocate here and can see some justification for cutting these routes. Preferrably, I’d prefer that the TTC do not do any level of service cutting, but it should be pointed out that some of the routes could be untenable in the future given the changing demographics of the areas they serve. If any of these routes should be cut, the TTC should consider diverting the resources to other areas to ensure that these areas have the services they need. 1. The TTC uses the catch-all phrase “Poor Performing Routes” when what they are really talking about is “expendible routes” from a service coverage point of view. These are not necessarily the routes with the highest loss per passenger. This is an important distinction because I have heard several very puffed up speeches from Councillors who claim that “their routes” outperform other parts of the system when, in fact, they get just as much if not more subsidy per rider. 2. The idea of “alternative services” starts to come unglued when you look at the compound effect of various service cut proposals where route “A” is cut on the assumption that route “B” fills in, and then route “B” is cut so that it no longer runs 7 days a week, 20 hours a day. Also, the TTC tends to look at a map with little regard for topology or geography, and they neglect that straight line access to the “alternate route” may not be available. My all time favourite was a proposal that treated a service on one side of Grenadier Pond as an alternative to one that was on the far shore. This is obviously where the ferries come into play. To add to the above poster’s remarks. There are several other routes the TTC could consider ahead of scraping buses along important side-streets like Dupont and Pharmacy. 1. 28 Davisville- On point the Davisville bus is utterly useless only serving one or two extra customers on Belsize/Millwood loop. 2. 81 Thorncliffe Park- Thorncliffe Park is already well served by the 25, 56, 88 and 100 so keeping this route alive just to connect with Pape Stn only adds to the graidlock on the Leaside bridge and beyond. 3. 82 Rosedale- This route is utilized primarily by school-aged commuters and would only add 10 mins walk from anywhere in the community to Summerhill, Rosedale or Sherbourne Stns if it were eliminated. 4. 78 St Andrews- This route’s so reclusive I can’t tell you once I’ve ever seen it in York Mills Stn. Unless they plan to amalgamate all three 401 area routes (St Andrews, Silver Hills AND Graydon Hall) into a continuous line, each are likely to be phased out at some point. 5. 99 Arrow Rd- This doesn’t even connect to a subway and yet what is it’s purpose? In my opinion amalgamation is key. The longer a route is the more commuters will utilize it making higher revenue per passenger per boarding. For instance merging routes like 6 Bay and marked for elimination 127 Davenport could bring commuters from midtown into the core faster than even the subway can(interchnage at Spadina/Bay, another at St Geogre/Yonge to head downtown). Steve: 28 Davisville is functionally a short-turn of 11 Bayview and provides supplementary service on Davisville itself. Why the TTC persists in keeping the separate name rather than amalgamating the routes is beyond me. 81 Thorncliffe Park: The loop around Thorncliffe Park is lined with high rises and the 81 is an important service through this area. Making people walk out to Overlea is totally unfair. Also, like the 28 above, the 81 is functionally a short turn of the 25 Don Mills providing extra service from Thorncliffe Park down to Danforth. 82 Rosedale: I can tell you from personal experience that the walk from “anywhere in Rosedale” to the stations mentioned is considerably longer than 10 minutes (and I don’t live in Rodedale). Also, in case you have not tried this yourself, it is physically impossible to walk west on Summerhill to Yonge from Rosedale. The Avoca ravine is in the way. Yes, there is a pedestrian route, but it’s very roundabout and certainly longer than 10 minutes even for someone in quite fit condition. 78 St. Andrews: I have actually used this bus on occasion and it carries good loads into an otherwise inaccessible area. 99 Arrow Road: Serves the TTC Arrow Road garage. As for statistics, 82 Rosedale has a better performance than the surface system average. Just because the neighbourhood full of rich people doesn’t mean it doesn’t deserve transit service. There are a lot of renters in Rosedale who do not fit the plutocrat image, and they take the bus. There is only one bus, and it carries more riders per day than many major routes on a per vehicle basis (1,500 on Rosedale versus a bit under 1,000 on the bus system as a whole). 78 St. Andrews is another matter, but it has the “disadvantage” of having better service than the 82 and a line-haul segment on York Mills that has no equivalent in Rosedale. Interesting stuff, just want to make sure I understand your last table. Is the York University routes then the third worst revenue-generating busline? As a York student, who does commute and appreciate the Rocket, do you think the TTC may ever decide to cancel the express and go back to having just the 106 route to save money? I was in favour of the subway, and the express ride, but if it’s costing the TTC more, which is costing me more in fares, I’d really rather wait in line longer for the 106 and lose our express. Steve: No, you are misreading the table. That last table gives the total loss per day for each route based on the TTC figures with no adjustment for the number of riders or vehicles on the line. What this table shows is that the most money (in absolute terms) is spent on Finch East, Steeles East, York U (local and express) and then Eglinton West. If you compare these values to the daily loss for the Sheppard Subway, they are in the same ballpark, and two of those bus routes are higher. The point in that particular table is to show that many routes “lose” a lot of money because of the way the TTC allocates revenue, but they are never described as “poor performers”. Gridlock on the Leaside Bridge?? I frequently drive across that bridge in rush hour. That behemoth is 6 lanes wide, and moves just fine. Even when restricted to from 3 lanes to 2 lanes traffic is good. It’s only when down to 1 lane that gridlock occurs. It’s the overcapacity of this bridge that has lead me to suggest in the past, that if at all possible, the 6 lanes should be replaced by 4 lanes and 2 sets of track for the Don Mills LRT. The route of this bus takes it to several high-density apartment complexes: at The Links and Tournament Road, Lord Seaton Road and Upper Canada Drive, Upper Canada Drive and Montressor, and Fifeshire and Carluke. Not to mention an office complex at The Links and Tournament. You may not know it, but despite the rapid conversion of residences to really expensive houses, it carries heavy loads during the morning rush hour when three buses are used. As for 115 Silver Hills, as I said earlier there is a possibility of integrating this route with 78 St Andrews and maybe extend it to Leslie Station (only one additional bus required instead of the two that currently ply the 115). We’ll soon find out what the TTC comes up with. Internally, this bus is referred to as a branch of 11 Bayview, but then again, it wouldn’t be called a Bayview bus if only one block of this branch actually ran on Bayview. Bayview is in fact the “destination”, it wouldn’t make sense to refer to the route as 11D Bayview – To Bayview, right? Also the 11 Bayview bus gets quite crowded on Davisville especially on Rush hours, which is why they need this supplementary bus service. I did hear about a potential expansion of this route, which would run via Millwood Road to Overlea and Laird and possibly the Thorncliffe Park development area. As for 81 Thorncliffe Park, the reasons that Steve stated also account for the fact that the 303 Don Mills was rerouted to serve this area instead of running straight through Overlea. I have to point out an error in my earlier analysis. It turns out the railway corridor I mentioned in the 127 Davenport is in fact north of Dupont, and not Davenport. What IS north of Davenport is the large bluff in which major roads intersecting this road must make a significant climb and is inaccessible to most side streets, especially the portion between Spadina and Dufferin. But my opinion of this route stands, if they have to cut 127 Davenport, they had better leave 26 Dupont alone. Cutting both would be a double whammy for the area. One other comment regarding the 122 Graydon Hall that jj had mention. This route itself not only serves the Lesmill industrial area, but it also serves large swaths of apartment buildings on Graydon Hall Drive and Fenelon Road alone. It boggles me why they will not consider adding weekend and evening service to this route. At least the 78 St. Andrews goes to the evening, but again, no weekend service. I could be wrong, but I think the Dupont bus is the only east-west accessible route running west of Yonge Street, in the lower half of the city. I use this route occasionally and do see riders in wheelchairs on board. The route itself runs between two of the few B-D stations with elevators. I’m not sure if these people would have alternatives to get around or to/from the subway. Unlike the “fully accessible” Junction bus, which still has high floor buses running on it (including off peak), the Dupont bus seems 100% low floor. This route is also part of the “Accessible Alternative” for when the elevator is off line at Dundas West station (and what a detour that sends you on!). After looking at the maps, I’m pretty sure, there’s no accessible way to get to the subway from Dundas West without the Dupont bus. How does the TTC know how many customers per day they have on a given route. Obviously if I put something in the farebox-cash, ticket or token-they know I was there. But suppose I board using a pass or a transfer-neither of which is surrendered-, then how is my presence recorded? Steve: Once a year, less often on major routes, the TTC has passenger counters riding the buses and streetcars to actually count the ons and offs at every stop. Of course, these one day counts may happen to hit a low day because of weather, and there’s at least a 10% swing either way from a one day count to the actual average. But that’s how it is done. re: Leaside bridge – as someone who drives across it at least weekly it is incredibly wide, granted, but the problem is what happens when you get to the southern end of it – that triangle junction is messy and Pape too narrow for onstreet running. What interests me is that even though we have a 75% farebox recovery rate every bus route loses money. One would think that given the high farebox recovery some bus routes would make money; in fact, I remember old reports that did have some routes making money. Did they change the way the finances were conducted, Steve, to make it seem like every bus routes loses money? And, given the farebox recovery, something has to make money. My guess is that the subway “makes money” and possibly a great deal of it, if every surface route loses money. Is that right, Steve? As for passenger counting, does the TTC have any plans to install automated passenger counters on buses like LA does? Infrared beams at the front and back doors count every person getting on or off when the vehicle is in service. It’s proven to be very effective in matching service to demand. Steve: Yes, some surface routes used to “make money” in the TTC’s calculations (which of course are highly dependent on how the revenue is allocated), and even these routes had proposals to cut service. Clearly “profitability” had nothing to do with such recommendations and was merely a simplification for politicians whose analytical abilities are not up to the nuances of a real analysis. I would love to see the subway and RT included in the TTC tables so that we would see whether (a) all of the left over money actually does go to the rapid transit lines or (b) the revenue and cost allocation model is flawed to the point that it reports a much lower cost recovery than we actually have for the system. Seeing that the surface routes only average about 50% when the system as a whole is known to run at 75% or higher recovery suggests that something is badly wrong with the model. I believe that the TTC has tested some infrared passenger counters, but as I have still seen real live counters on vehicles, I have to assume that the automated counters didn’t do the trick. One problem I do know they had was that vehicles with people riding in the stairwell (of course that never ever happens ) returned completely unreliable data. Chris asked about passenger counting. The TTC did try this in the early ’80s, possibly as part of the first CIS rollout. There were pairs of emitters/photocells on one side of the door and a couple of basic round white safety reflectors (as you would see on a truck) on the other side. Some old New Looks may have gone to their graves with the reflectors still in place; at the back they were held on a box attached to the centre stanchion between the two doors. Such a system may work okay for light loads, but it probably won’t handle heavy loads very well. In theory the two photocells should be able to tell if someone is boarding or alighting, but I suspect that would be problematic as well. Does LA have rules about boarding only at the front and exiting only at the back? That would simplify the programming a good deal. Stephen Cheung your comment about the 115 Silver Hills bus and people in the loop never taking the service, because they are to rich, caught my attention. My grandparents use to live on the 115 Silver Hills route in that very area. Most of the huge Mcmansions are going in west of the loop, on streets with no bus service. And while the rest of the route does operate through posh areas pass large houses, it still sees ridership with business people taking it home from the subway. Actually when the TTC wanted to merge the route with the 78 bus, I actually represented my grandparents for the neighbourhood group that formed to stop the merger and keep the bus operating as is. Considering it is a rich area I to had my doubts about support for the route. But it turns out there was support, and we actually stood up at the TTC meeting years ago, and stopped the merger of the routes. Your comment does also bring up a interesting point. The TTC is known as a system that everyone uses. But should we just assume that people with money will never step foot on transit, and does that mean that rich areas like the Silver Hills area should not get TTC service? Second, have you noticed all the really expensive housing and Mcmansions going in near the subway, and along bus routes within a 5-10min ride of the subway. Is this is a good idea(I know it is market forces and we can’t do anything)as it could mean a ridership decline in the area. We are getting into a situation that people who are not going to use transit much, are living in the best areas for transit access?